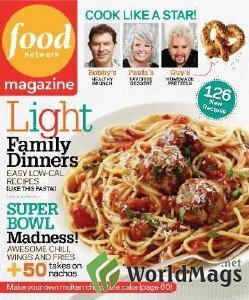 FOOD NETWORK (Alaina) - After looking at all the wonderful recipes, I finally settled on the delicious looking homemade pretzels in this issue. 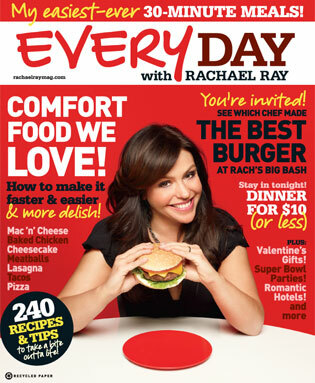 The 3 page article, photos, and recipes were so inviting. And (if we are being honest) I love bread and I have wonderful memories of making pretzels with my mom. I had illusions of making memories with my kids as we twisted pretzels into all kinds of fun shapes. This was a fail. My oldest son opted to stay in (instead of sledding) to help me. And part way through, he sweetly said, "Mom do you think I'm a little better at this than you?" I had to laugh and agree with him that he was indeed "a little better." I think it failed because, despite my familiarity with yeast, my dough was a bit dry and I underestimated the time commitment. Anyway, we made the pepperoni pretzels, the sweet pretzels, and the everything pretzels. They seemed impossible and took forever but they actually tasted pretty good but they were not the great soft pretzel I was going for. 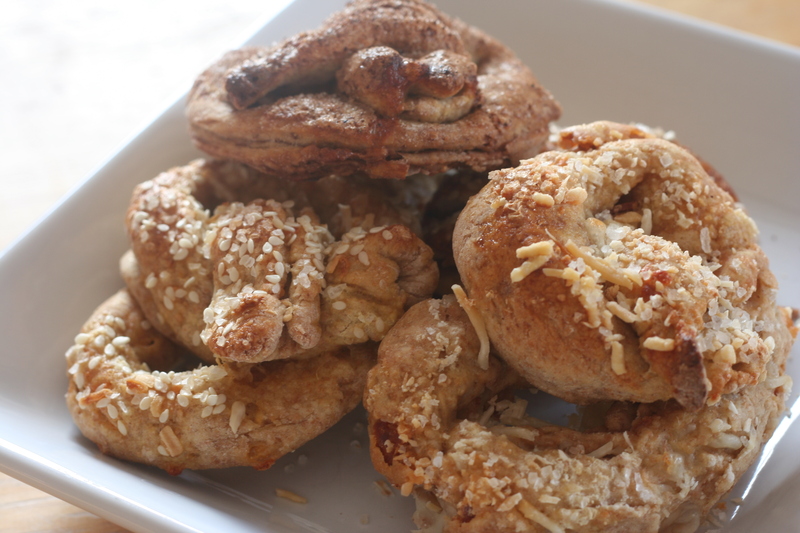 And I would try making pretzels again but I'm going to get my mom's recipe because I do love homemade pretzels. Here's the link to the recipe - use at your own risk - it has not gotten very good reviews on the website either, I'm afraid. 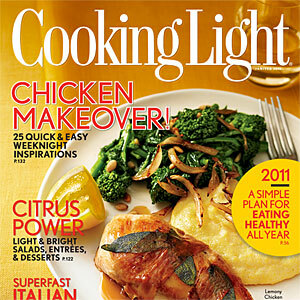 COOKING LIGHT (Alaina) - This issue had 25 different ways to cook chicken and so chicken was the natural choice for a recipe. I opted to use an unfamiliar cooking method which was basically pan frying chicken that I had pounded thin. I know many people love this method because it is quick, easy, and tasty and after trying it, I will definitely be incorporating this into my repertoire. 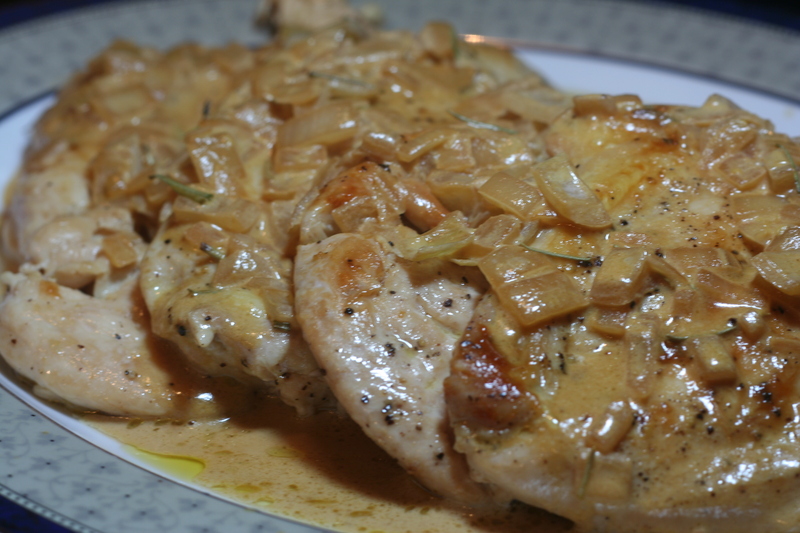 The Dijon pan sauce was incredibly good and the whole family declared the chicken delicious. I served it alongside mashed potatoes inspired by a side dish recipe in this issue that had caramelized onions in them - they were really good, also. Anyway, the recipe went together quickly and in about an hour I had a meal that could be completed with the addition of a green salad or some steamed broccoli. The rosemary and garlic in this really stand out and make for some good eating! Preheat the oven to 425°F. In a resealable plastic bag, rub pork chops with two-thirds of the garlic and 2 Tbsp olive oil; refrigerate. In glass baking dish, combine the onions, vinegar, 2 Tbsp olive oil and 1/2 c. water. Cover and bake until liquid is almost completely reduced, about 50 minutes; season with salt and pepper. Meanwhile, in a medium saucepan, combine 2 c. water, lentils, rosemary, and remaining garlic. Bring to a boil, then lower the heat and simmer until lentils are tender and the liquid is absorbed, about 25 minutes. Stir in 1 Tbsp olive oil, season with salt and pepper. In a large skillet, heat remaining 1 Tbsp olive oil over medium-high heat. Add pork chops and cook, turning once, until golden and just cooked through, about 8 minutes; season with salt and pepper. 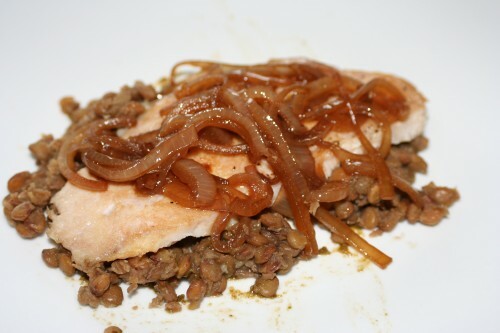 Serve pork chops on a bed of lentils topped with onions. Serves 4. This is one of my favorite features here. Thanks for pulling this together each month.